The only thing as relentless and uncompromising as a zombie horde is those tasked with reviewing said zombie horde. The undead cower in the face of the Left 4 Dead 2 Frankenreview. It's a year after the release of Left 4 Dead, and the zombie invasion has made its way South, where a different breed of survivors wait to take them on. Survivors not afraid to pick up a baseball bat and knock some heads around. It's not just the location and the cast that's changed either, with new game modes to keep the infected and not-yet-infected occupied until help arrives. Is this the sort of peril the assembled game reviewers would launch themselves into? Just like the first, the general premise of the game is to brave the oncoming horde of undead in the hopes of making it to each level's safe house. How you'll make it to the end, as well as what measure of difficulty you'll contend with, is largely decided by the director: the game's all-powerful, all-knowing A.I. Depending on your performance, the director will affect certain factors like weapon placement, item spawns, and the much-dreaded crescendo events. All of this, and much more, factors into Left 4 Dead 2's brutal algorithms. Big parts of the level layouts and even weather conditions change every time you play through a level, resulting in a different experience each time. This time around, you'll play as four different characters: Coach, Ellis, Nick and Rochelle. Each controls exactly the same, but their unique stories add depth to their personalities. Valve also mixed things up with five episodes set in the Deep South: Dead Center ("Prices aren't the only things getting slashed. "), Dark Carnival ("You must be this tall... TO DIE! "), Swamp Fever ("The only cure is dying. "), The Parish ("This time it all goes south.") and Hard Rain ("Come hell and high water."). All of them feature the same final objective (make a last stand until help arrives), but the detailed scenery sets each one apart. Dark Carnival, for instance, not only takes place in a monster-infested amusement park, but also sports a final mission where you must battle zombies at a rock concert, complete with fireworks and music. Another, Dead Center, challenges you to navigate a shopping mall and eventually pour gas into a racecar to make your getaway, while scores of enemies pour through the entrances. Those already expecting new, high-contrast locations and graphical themes wrapped around refined gameplay may still be shocked by the bold changes to the structure of the five campaigns we get this time. Dead Center sets the tone, with an escape from a burning building, a rush to re-supply an entrenched caffeine addict, and a finale that is still built around a siege like the ones in the first game, but which requires you to gather petrol cans to fuel a car rather than simply surviving waves of attack.The others go further. Hard Rain sees you fighting through a town one way and then fighting back through the same locations as a violent thunderstorm floods them. Littered across each new setting are brand-new saliva-inducing melee weapons like the katana and frying pan. You have not experienced ghoul-gibbing bliss until you've been bum rushed by infected and spun in a circle while wielding a chainsaw. Melee weapons fit so naturally into L4D2 that you'll wonder how you ever managed the first game without them. Other useful items and firearms equally expand gameplay. Use a defibrillator on a fallen friend, pump yourself with adrenaline for a life-saving speed boost when you're in the red, or throw a vial of boomer bile at a charging tank and laugh with twisted delight as nearby zombies tear it to shreds. The standard weapon types of shotgun, automatic, and sniper rifle now feature a broader variety with unique characteristics as well. All these additions combined with the brand new grenade launcher allow your band of survivors to methodically customize your strategy like never before. Then there are all the little details. Pipe bomb explosions now create a satisfying spray of ragdolls. The individual infected suffer wounds to different locations on their bodies, with visible differences resulting from various caliber firearms, or large gashes in the case of bladed melee weapons. Alarmed cars are more randomized, along with paths through certain areas. Finally, game modes like scavenge provide a quick and furious multiplayer option for when you don't have a whole hour to kill. ...if you didn't care for the original Left 4 Dead's brand of multiplayer mayhem, Left 4 Dead 2 won't do much to change your mind. Me? I did care for the original Left 4 Dead, deeply, playing more of that game than any other this year. 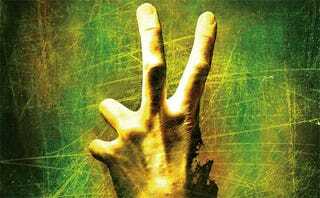 Left 4 Dead 2 brings with it the same high quality, the same barebones storytelling and, at its core, the same intense competitive and cooperative gameplay. But that gameplay has been heavily tweaked, radically changing and improving the experience for the Left 4 Dead veteran, offering a unique environment in which to get infected all over again.